Standing at the top of a snow-covered hill, Azor shivered. If only that rabbit hadn’t crossed his path he would now be snuggled up by the fire at his master’s feet. With the scarcity of rations at Valley Forge there was no way he could pass up the chance of a rabbit dinner even if the rabbit did turn out to be a rather scrawny one. His hunger satisfied Azor looked around. His keen sighthound eyes spotted the curving track of the Schuylkill in the distance. He knew that if he followed the river he would get back to Valley Forge. His master, the Baron von Steuben, must be looking for him by now. A chill breeze caused Azor to shiver again. 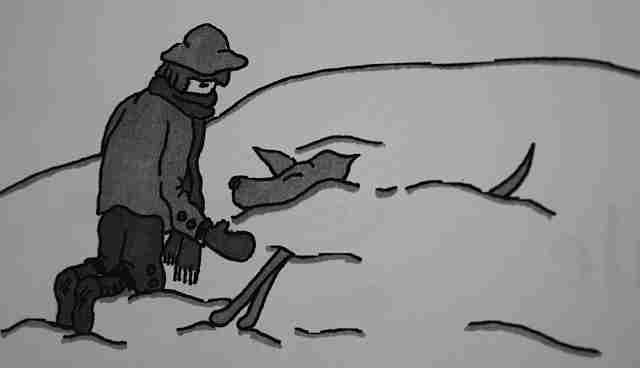 The light snow had changed to sleet and the Greyhound’s short fur was no protection against its stinging pellets. Eyes fixed on the distant river Azor plodded toward it. The snow got deeper with each step he took and soon Azor’s slender legs were bloody from its frozen crust. Exhausted, he could go no further. Lifting his muzzle to the sky Azor howled his frustration. The howl rose and fell in the cold crisp air. Once again Azor howled… AROOOooo… then silence. A short distance away ten-year-old Betsy Allen stopped dead in her tracks. Caught by surprise her 12-year-old brother Seth crashed into her sending both of them tumbling to the ground in a cloud of white. “Ouch! Watch where you’re going.” Shaking the snowflakes from her blonde braids, Betsy’s cornflower blue eyes shot sparks at her older brother. “Didn’t you hear the w-w-wolf?” stammered Betsy. AROOOooo… the howl came again. “And I told you it can’t be a wolf… a dog maybe.” Trying to be brave, Seth added, “Come on Bets, we’ve still a ways to go.” To be on the safe side, however, he picked up a good-sized branch to carry. They had gone only a short distance when Seth turned to urge Betsy to hurry up. In doing so, he tripped over something and landed sitting…next to a pile of…fur? Startled, Seth lifted his branch like a club. Then, dropping it, he knelt in the snow. “Is he dead?” asked Betsy joining her brother and gently stroking the still form. 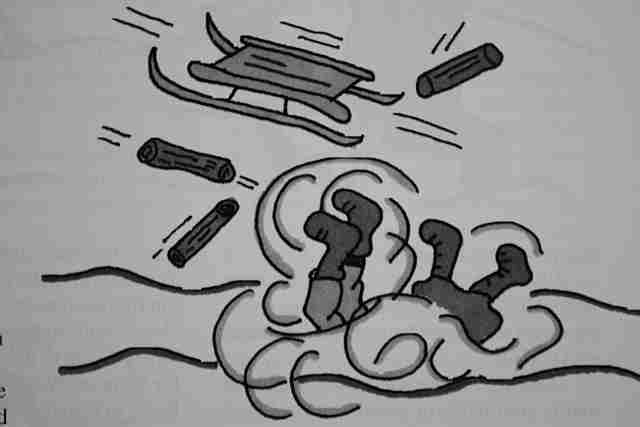 Between the two of them they got the unconscious dog on the sled. Then with Seth pulling, and Betsy holding onto the dog to keep him from sliding off, they headed home. Heather Allen pushed back a lock of grey-tinged auburn hair as she surveyed the scene outside her window. Seth and Betsy had returned, but instead of the expected load of wood, they seemed to be struggling with some sort of animal. Grabbing her shawl off the peg next to the door Heather hurried out to see what was going on. “Who’s too heavy? What are you up to and where is the wood I sent you after hours ago?” Heather’s identical green eyes met Seth’s. Stripping off her shawl Heather spread it on the ground. “Help me get him on the shawl; we can use it as a stretcher.” Between them they carried Azor inside and lay him down on a rug before the fire. While rubbing the dog dry Heather noticed his fine leather collar. Looking closer she could see a name burned into the leather – A-Z-O-R. Hearing his name, Azor stirred. Azor heard the voices of the woman and her children, but couldn’t make out what they were saying. Next he felt his head being gently raised as soft fingers coaxed his mouth open. A drop of something warm was put on his tongue and trickled down his throat. Instinctively he swallowed. After several spoonfuls, Azor drifted off to sleep. “Is he going to get well, Mom?” asked Betsy. Seth took a spoonful of stew and hesitated. It felt like he was being watched. Sure enough, Azor’s eyes were open. Taking a small piece of meat between his thumb and forefinger Seth held it out to the dog. Azor sniffed… it smelled good. Raising his head he gently took the piece of meat into his mouth and rolled it around with his tongue. Finishing that piece Azor looked hopefully at the boy. His eyes pleaded for more. Azor obligingly opened his mouth. Yum, that tasted even better! Satisfied for the time being Azor stretched out and was soon fast asleep. “Can we keep him, Mom?” Seth pleaded. “Please, Mom,” chimed in Betsy. Later, after checking on Azor, the three of them went upstairs to bed. During the night the storm picked up again. The wind coupled with heat rising from the chimney caused snow on top of the chimney to melt and fall down inside. Swooooosh! Hssssssst… The snow hit the banked fire causing sparks to fly in all directions. One spark lodged in a crack between the floorboards and began to smolder. Sensing something was wrong, Azor opened his eyes. Orange fingers of flame hungrily licked at the floorboards nearest the fireplace. He struggled to his feet. The woman and her children… he had to warn them. Looking around, his keen eyes fell on the stairway… they must be up there. In his weakened condition it was like climbing a mountain. Struggling over the top step he glanced below. The room was fast becoming an inferno. Entering the first room he came to, Azor gave a loud bark… WOOF! Thinking quickly, Heather closed the door and stuffed a blanket under it. Then she opened the window, glanced at the children and looked down. With the children gone, Heather huddled on the floor next to the open window. Holding tightly to the trembling Azor, she tried to reassure him that help was on the way. A crackling sound drew Heather’s gaze to the door. It now glowed a brilliant orange and the blanket was smoking. A scraping of a ladder against the outside wall and a man’s form appeared at the window. “Heather, where are you?” It was her brother, John. Seeing the glow of flames, John urged Heather to hurry, but she insisted he take Azor down the ladder first. She lifted the dog up to the windowsill where John could reach him. Then, with smoke billowing behind her, Heather climbed over the windowsill and, holding tightly to the ladder, slowly followed John and Azor to the ground. With a mighty roar and a shower of sparks the roof collapsed on the rooms below. The sound crashed around their ears. Watching the destruction of their home, Betsy clutched Heather’s hand, crying uncontrollably. Seth manfully tried to appear stoic as he stood, holding Azor by the collar, but tears rolled down his face unchecked. Drew Allen, his business with General Washington completed, chose to ride along with a scouting patrol that was going his way. Also accompanying the patrol was Baron von Steuben. The Baron, a Prussian army officer, had come to Valley Forge to train American troops. This morning, however, he was looking for his missing Greyhound, but feared that he would find the dog’s lifeless body if he found him at all. “Rider approaching,” called out one of the scouts. “But we don’t own a greyhound,” stated a bewildered Drew. Heather placed the stew pot in her growing pile of items salvaged from the rubble. Pausing, she looked up to see a party of horsemen approaching. Recognizing Drew and John in the group she went to meet them. Dismounting, Drew gathered Heather in his arms and held her close as he surveyed the rubble that had been his home. “It’s a miracle that you and the kids are alive,” he murmured shakily. A door slammed. This was followed by cries of delight as Seth and Betsy spotted their father. They ran to meet him, Azor trailing along behind. 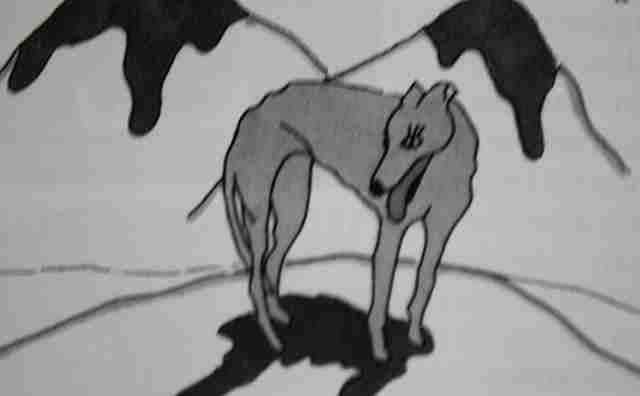 Upon seeing the greyhound, the Baron slid from his saddle and crouched down in the snow. “Azor, my friend, come here to me.” The Greyhound’s ears went up and then, with a joyful yelp, he ran to his master, tail wagging furiously. Seth looked at Betsy. Understanding and disappointment showed on their faces. Azor hesitated as the patrol moved out, torn between his master and the children. He started to follow the Baron and then stopped, glancing back at Seth for reassurance. Drew and Heather exchanged knowing glances. The greyhound pawed the ground and whined. For a long moment his expressive brown eyes lingered on Seth then, making his choice, Azor ran after the horsemen. Author’s notes: There really was a Baron von Steuben who trained American troops at Valley Forge. The Baron also owned a greyhound named Azor. All events portrayed in this story, however, are fictitious. The REAL Baron von Steuben was a Prussian military officer who spoke very limited English. He usually communicated in French or by means of translators. The Baron, his favorite greyhound Azor, and several aides sailed for the Colonies from France in 1777 on a military ship disguised as a merchantman. After landing at Portsmouth, New Hampshire, the Baron and his entourage traveled over land to Boston where they were detained for five weeks while awaiting orders from Congress. It was in Boston that the Baron’s landlady, a Mrs. Downe, assessed a charge for Azor much to his displeasure. Duponceau, one of the Baron’s aides, commented that he couldn’t understand why the Baron objected since Azor ate as much as any of them. From Boston, the Baron’s party traveled to Valley Forge by a roundabout route as Rhode Island, New York City and Philadelphia were under the control of the British. Details of Azor at Valley Forge are sketchy at best. Following the Revolutionary War the Baron and Azor stayed in America. Azor apparently was long-lived as a letter written by the Baron in 1786 mentioned that he had been ill and confined to his room, alone except for Azor.